Hi, I have somehow created a color change when you click on a form field. I don't know how it happened but it's there and I need some assistance to find where it's happening. 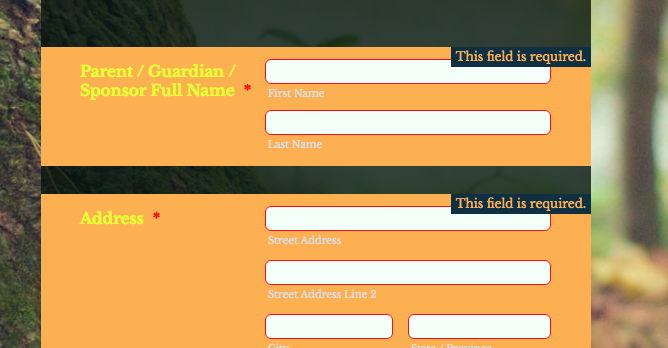 In order to cancel this active css property, you need to add following css code block under your Form Designer CSS Tab. This css block is going to resolve your issue. Hi, I'm still having some trouble with the error message. I've been trying to get the colors to be balanced / legible on error. I cleaned up a lot of duplicative code from the body, but i just can't seem to figure out which piece is applying here. You can just simply change the color hex value that was provided by Scott and it should resolve the issue. In any case, feel free to let us know if you have additional questions or other concerns. Yeah, that wasn't it. That changes the error message in the upper right, and i was ok with that. It was the main primary text on the input box description that I was trying to change. I tried picking a better background color and it's showing more legibly so i'm good with it. Let us know if you ever need anything else!